snom ONE is an IP PBX software for all major operating systems (Windows, Linux and Mac OSX) offering all the advanced features of a full featured PBX including calling queues, auto attendants, call forwarding, parking and more. The snom ONE PBX requires a free or paid license to operate. Therefore users will need to obtain a license, either directly from the snom ONE website or a reseller. This setup guide is intended to show the most basic configuration of the snom ONE PBX. For more advanced configurations and features you can combine the basics included in this guide along with the snom ONE documentation. In this guide we will configure snom ONE through the web interface to properly route both incoming and outgoing calls to and from Callcentric. 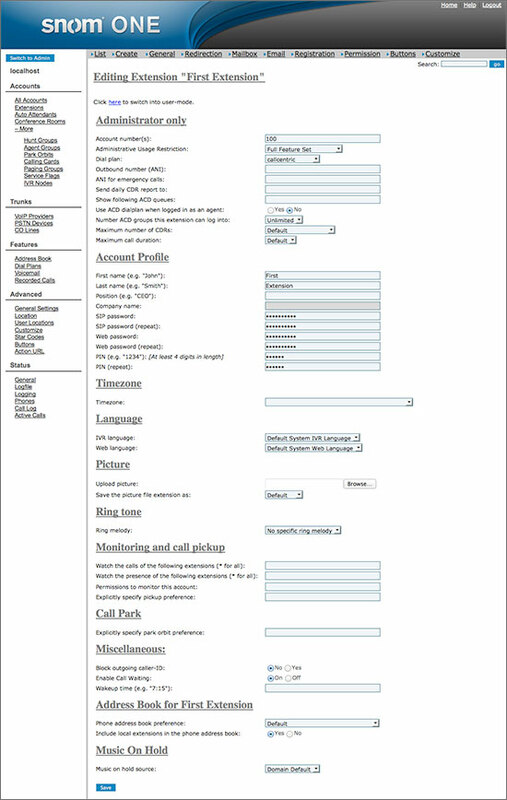 The information presented in this document is based on version 5.1.2 (Debian32) of the snom ONE software. This guide assumes that you have installed snom ONE and that the snom ONE install steps were completed properly, including obtaining the proper license. This guide also assumes that you have administrative access to the snom ONE administration interface. If you haven't already please follow this step to add a new domain to your snom ONE PBX. Otherwise you may skip this step. You will need to select the domain you wish to configure. Note that your users count may differ from the number shown below. A trunk is used to route calls to or from your snom ONE PBX and Callcentric. Here we will configure a Callcentric trunk on your snom One PBX. User name (for registration): This is either the default extension 1777MYCCID OR 1777MYCCIDEXT, where 1777MYCCID is the 1777 number assigned to you by Callcentric and EXT is the three digit extension you are trying to register this UA to. Password (e.g. "secret"): Enter your SIP Password here. Your SIP password is the same password you create when you sign up for your Callcentric account. Optionally you may change it in your account preferences. 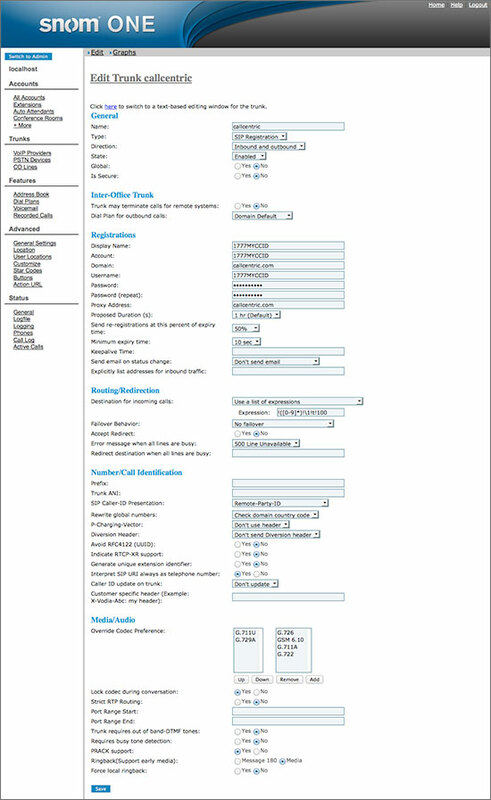 After specifying the settings above, you should be redirected back to the Current Trunks page. 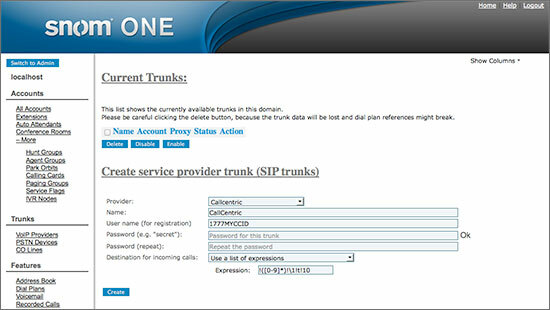 On this page, click on your newly created Callcentric trunk, as you will need to make additional changes to your trunk. Here we will add a default dial plan for the localhost domain if there is no default dial plan. 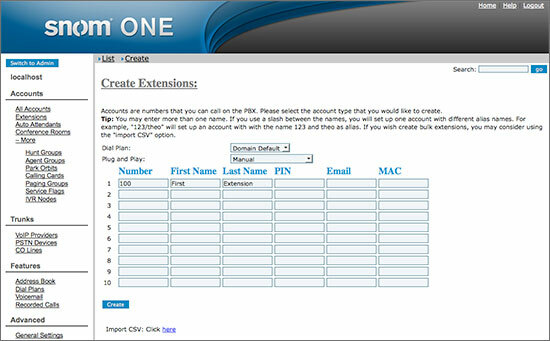 An extension in snom ONE is an account that provides a number which another UA (software or hardware used for calling) can connect to in order to make and receive calls. *If you have already configured an extension then you may skip to editing the extension. Then in the next step (Inbound Call configuration) you may use your existing extension. Set the Dial Plan option to callcentric, which is the dial plan we created earlier. Use the IP address or hostname for your snom ONE system along with 100 (the extension created earlier) as the username and the password for extension 100 to register to your PBX. Step 7 That's it! You can now make a phone call.